If there was a battle between lemons and calamansi (the small native Philippine lime), I’d be rooting for the lemon. My friends think it’s strange that I don’t like calamansi, considering that I’m Filipino. Sometimes when we’re eating out, and we would be given tiny saucers so we can make our own dip out of soy sauce, vinegar and calamansi, they would grab my pieces without hesitation. What’s exactly my beef with this little defenseless humble lime? Well, I would always rationalize that this ‘loathing’ doesn’t have any rationalization. I just don’t like it. But maybe, if I need to give concrete insight, maybe the calamansi’s citrus scent doesn’t appeal to me, the way the fresh clean lemon scent does. 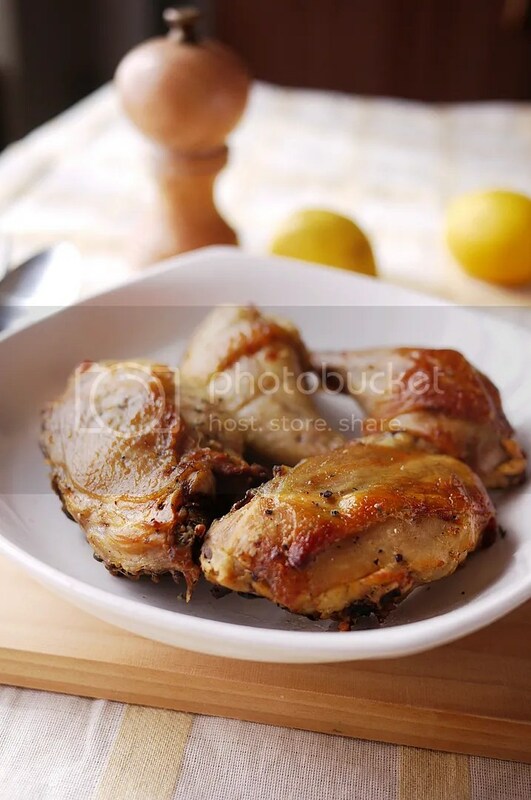 The lemon’s scent and acidity lend themselves well with chicken. I decided to make this on the fly because people were coming over (another story altogether, sorry if I’m being evasive! ), and I was supposed to serve this to them, but the chicken ended up wrapped in foil for them to take home. The first batch ended up pretty dry but still flavorful, probably because I left them too long in the oven. As soon as the chicken hits the one hour mark, that’s when my paranoia sinks in, because I still want the chicken to be moist. I think I achieved it with the second batch (the ones pictured), because it tasted just the way I imagined it to be – the fresh tartness of the lemon absorbed by the meat, with delicate, paper-thin skin, and yes, it’s flavorful down to the bones. But of course if you’re a calamansi purist, I see no reason why you can’t use it instead of the lemons. But if you do have lemons lying around, well, you know what to do. Combine the marinade ingredients in a bowl large enough to hold the chicken. Add in the chicken and marinate for at least an hour, preferably overnight. When ready to bake, pre-heat the oven to 200 C. Arrange the chicken pieces in a baking pan, preferably with a rack, with the bottom of the pan lined with foil to catch the drippings. Place the pan in the oven and bake for an hour to an hour and fifteen minutes. flipping halfway. Bake until chicken’s skin is golden brown and the meat is done. When done, remove from oven and serve warm. Enjoy! 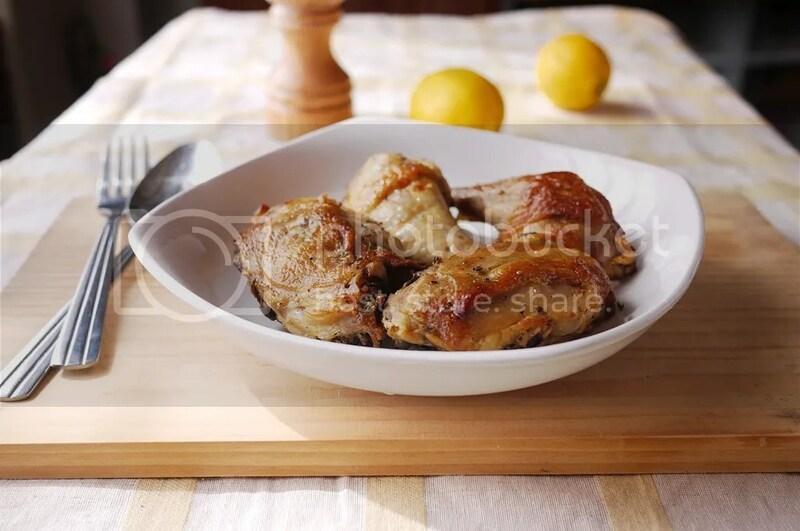 This entry was posted in Food & Recipes and tagged baked, chicken, fruit, lemon, lunch and beyond, main dish. Bookmark the permalink. love basic flavors like this for chicken! Haaay… dito hinahanap-hanap ko ang calamansi! Meron akong tanim pero baby pa… baka next season pa ako maka-harvest! This looks delicious! And it seems pretty easy to make. Thanks! what type of pepper do you use? Black pepper? Or hot pepper? I’ve never heard of calamansi before. I am a big fan of lemon pepper chicken and yours looks very good.